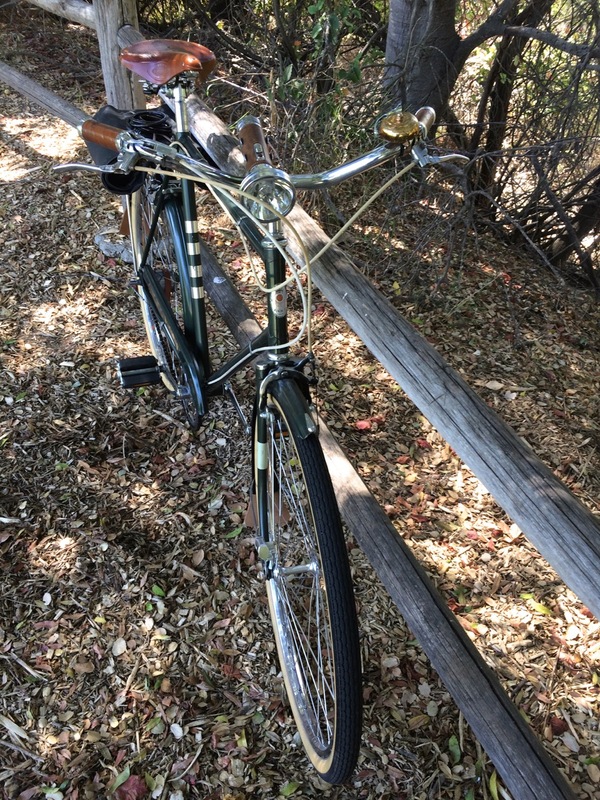 A blog viewer (Rino) has sent in a short story about his vintage bicycle. PAINT: The paint was odd as it looked like a wood table when someone put a cold cup on it – with white fogged spots all over it. I wanted to keep a vintage weathered look so I steel wooled (0000) the paint and then used an automotive clear coat from Duplicolor (best in a can paint I have ever used). The bike came out great keeping the look I wanted. WHEELS: The wheels were pretty thrashed and also mismatched, someone had put a Schwinn rear wheel on her. So after looking and looking I purchase rims from Velo Orange (650b), a totally rebuilt rear SA rear hub (1953). I went vintage Campy on the front hub, could not help that I’m Italian. I purchased the tires also from Velo. CHROME: All the chrome was rusty, but nothing that hours with steel wool, chrome polish and buffing did not cure. ACCESSORIES: The Brooks saddle was shot and now is hanging in my office as a wall ornament. But I wanted the bike to make sure that the bike would stand out. So I chose the honey Brooks saddle, hand grips and mud flaps. 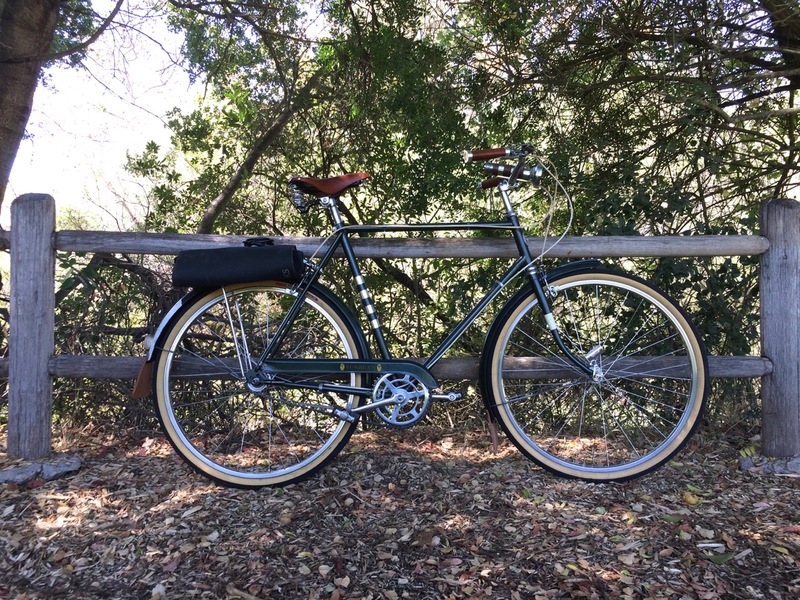 I was able to find a NOS rear rack which I then put Brooks oiled canvas bags on. Then to top it off I purchase NOS cyclometer, a vintage handle bar flash light and brass bell. I live in SoCal but the vintage bike license is from Hawaii – could not help that one, California had stickers for licenses and the plate is my birth year. Thanks for your site! It is great to see the love and use of these old bikes. A good buy @ $125.00 but located in Niagara Falls Ontario. This ones also on Kijiji for $130.00. Listed on Kijiji Toronto for $300.00. 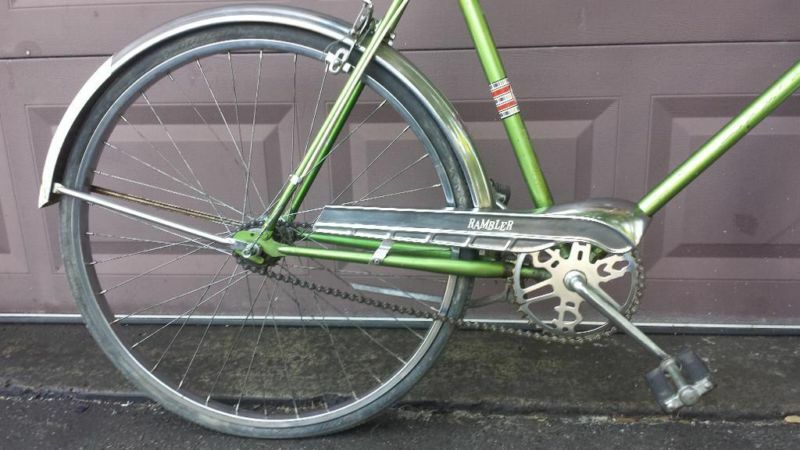 Also on Kijiji Toronto is this Raleigh built Eaton’s Glider 3 speed @ $150.00. This one popped up on Kijiji Toronto today @ $200.00. The ad claims it’s from 1953 but I think it’s a 70’s bike. Nice Brooks saddle. Raleigh made bikes for a number of different retailers to sell under their own in house brand. Western Flyer was one of them and sold through Western Auto stores throughout the US. This one is currently for sale on Kijiji Toronto for $130.00. I quite like the throttle style shifters. Not a vintage bicycle but vintage in Spirit. Linus has introduced a tasteful repro headlight for their bikes. Saddle tool bag by Electra (vinyl), Brooks saddle and wooden rear rack from Canadian Tire. There’s a guy who regularly has a couple of bikes for sale at the top of Sorauren Park. This is his latest offering. A mid 60’s CCM Imperial Tandem. 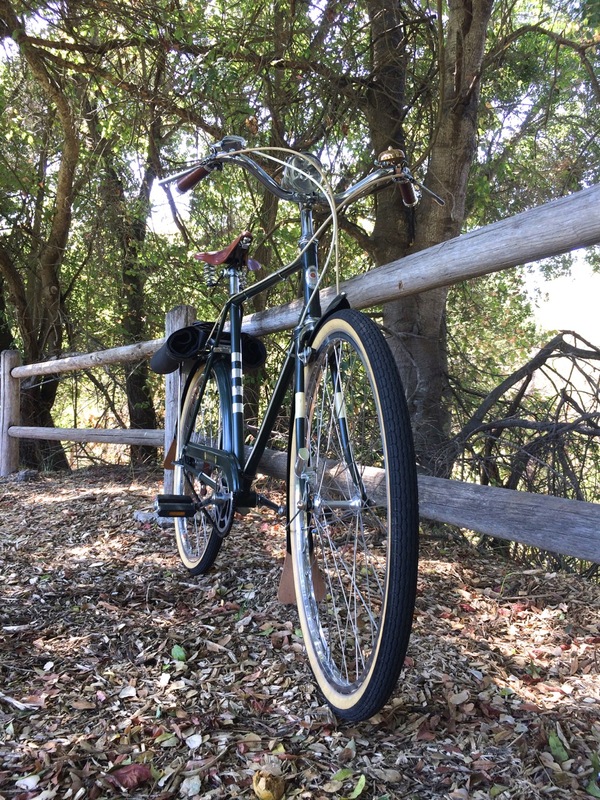 I bought my first vintage 3 speed from him a few years a go. 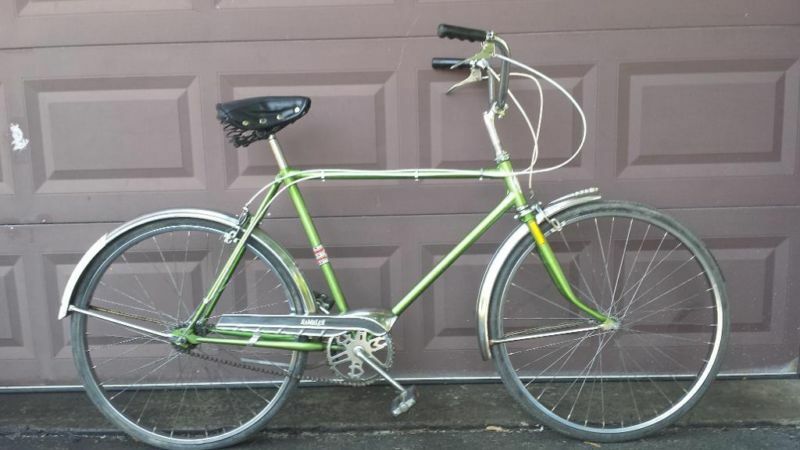 A Canadian built 1977 Raleigh Superbe which has proved to be a very reliable everyday bike. The saddle bags have since been transferred to another Superbe. This showed up on Kijiji Toronto this morning and I can’t find anything about it on the interweb. This one’s just come up on Kijiji Toronto @ $150.00. It appears to be original and in nice condition. This bike is currently for sale on Kijiji Toronto @ $500.00. Considering that the bike is tall, comes with a leather saddle, pump, bag, Dynohub, period horn and the key, the price is reasonable. 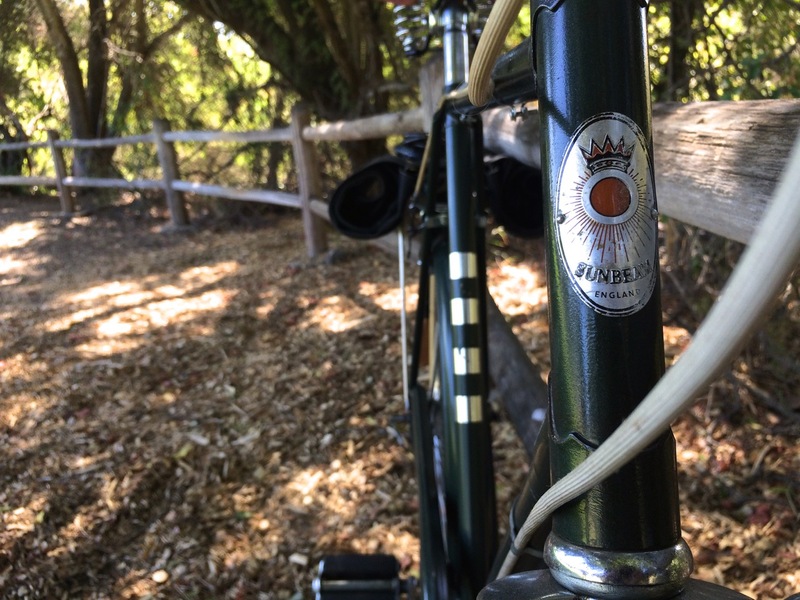 Despite the fact that I have several very nice English 3 speeds I tend to ride these 3 Rat Bikes more often. They were all virtually free. The 67 Dunelt @ $40.00, The green CCM/Supercycle (free from the trash) and the 69 CCM Galaxie ($39.00 in trade). It’s probably because I’ve invested more of my time into these and I’m not too concerned with their appearance. Currently offered on Kijiji Toronto. We have a firm date for this year’s show. Sunday, July 28th at Trinity Bellwoods Park here in Toronto. for more information contact the Community Bicycle Network. This top end model comes equipped with rod and drum brakes. Don’t drink and ride, you might fall off.